If you have a sweet tooth there is a new dessert bar in the Edmonton area to add to your baked-goods hit list. Confections Cake Co., tucked between Jack’s Burger Shack and Cerdo Tacos + Tequilla on Perron street in St. Albert, quietly opened on Tuesday last week, offering up an assortment of sweets late into the evening seven days a week. I spotted a tweet on Friday from my massage therapist about the newly opened dessert bar, which caught my eye as she mentioned gluten-free options. I happened to be in St. Albert on Sunday evening and was excited to learn they were open until 10 p.m. Actually, they are open every night until 10 pm! Confections Cake Co. owners Brittany and Jarrett opened their bake shop and cafe on Perron Street in St. Albert on April 10, 2018. At present, Confections Cake Co. is run entirely by life and business partners Brittany and Jarrett. Brittany, who hales from Vancouver Island, took three years of cooking school before studying pastry arts. She first moved to Edmonton to gain work experience at Duchess Bake Shop, before spending five years with Over the Top Cakes in St. Albert. The current menu features three cakes – each priced at $8 a slice. The Vanilla Berry features vanilla cake with vanilla butter cream with fresh berries. The Salted Caramel has layers of vanilla cake with caramel butter cream, salted caramel, and caramel popcorn on the top. 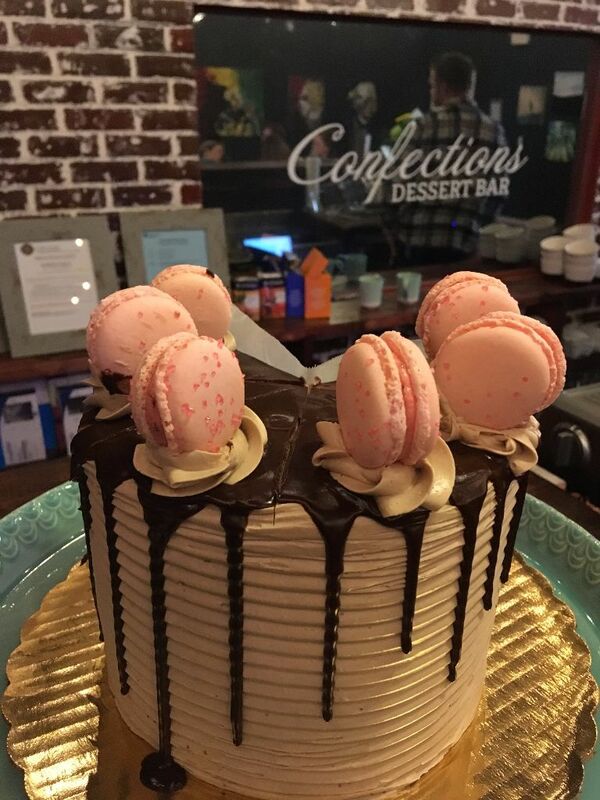 The sky-high Triple Chocolate chocolate cake is layered with whipped chocolate ganache, white chocolate ganache, chocolate buttercream, dripped in chocolate ganache and topped with macarons. Brittany is also serving up a New York style cheesecake, a chocolate mousse with a raspberry caramel on top, and a baked Canadian – a piece of chocolate cake with salted caramel and maple walnut ice cream that is wrapped in meringue, torched, and topped with candied bacon. Both the Baked Canadian and the chocolate cake can also be served gluten free. I was impressed by the price of her French macarons, just $1.25, as well as the bold flavour of the blueberry cheesecake and the root beer float that I tried. Brittany plans to carry 10 flavours including: bubblegum, strawberry, coconut, lemon poppy seed, root beer float, salted caramel, pistachio, chocolate cherry, chocolate raspberry. The delicate cookie sandwiches are also available in six or nine pre-packed takeaway boxes. An official grand opening is tentatively planned for Saturday, April 28 to coincide with their anticipated liquor license. The bake shop currently has a full menu of coffee items, but craft beer and cocktails paired with flights of dessert are in the near future. Based on their first five days of business Brittany told me it was a mix of customers ordering in and taking away, but she expects the custom orders for cakes and wedding cakes to increase. Brittany will also be offering a mix of sweet and savoury cooking classes at the bake shop and cafe – two dates for upcoming french macaron classes are ready for baking enthusiasts to register. Call (587) 873-6502 for more details on dates and times. The young entrepreneurs have filled the dessert bar with local art and hope to add more seating in time for the grand opening. When we arrived on Sunday night the place was busy; it appears a dessert bar is going to be in demand in St. Albert. I expect by the time the St. Albert Farmer’s Market opens on June 9th, Brittany and Jarrett will have a line up out the door. Tuesday – Sunday – 10 a.m. – 10 p.m.
Monday – 5 p.m. – 10 p.m.